Foundant is a powerful, cloud-based grant and scholarship management systems designed for funders and grant seekers. 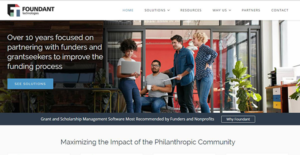 It’s an easy-to-use software that streamlines the day-to-day tasks of the granting process to maximize the impact of the philanthropic community. The solution supports over 1100 funders with an intuitive platform and expertise that stems from the collective knowledge of funding organizations, their applicants, and reviewers. Foundant Grant Lifecycle Manager (GLM) is dedicated to a variety of funder organizations including government organizations, family foundations, community foundations, corporate foundations, philanthropic advisors, public charities, and more. The platform empowers both applicants and administrators with reliable features that include online grant reports, automated reminders, Adhoc reporting, multilevel online reviews, multistage online applications, and outcome & impact tracking. Foundant is an online grant management system designed to be user configurable. It is a flexible solution that allows administrators to control the entire grants process and stipulate how their workflow works. The platform also offers reliable features such as the online applications which saves time and resources for administrators and applicants. The feature automates and simplifies the applications process and allow administrators to modify new applications without the help of Foundant staff. Other time-saving features include online reviews and online grants agreement & follow-ups. In addition, Foundant is a cloud-based system which means users can access the solution when and where they want, and from all the popular web browsers. The cloud-based nature promotes expediency by allowing applicants to submit applications online. Better still, staffs get the opportunity to quickly check the status of reviewers and monitor their progress via tablets, mobile phones, or computers anywhere, anytime. Foundant facilitates effective communication to streamline the entire granting process. The software provides an intuitive comment area to enable staffs and reviewers to communicate directly within the application. Additionally, the program allows administrators to send automatic email reminders as due dates for grants reports and grant paperwork approach. It permits staffs to set up personalized messages which are then delivered automatically thereby saving time. If you are interested in Foundant it could also be sensible to investigate other subcategories of Best Grant Management Software gathered in our database of SaaS software reviews. There are well-liked and widely used systems in each software category. But are they necessarily the best fit for your organization’s unique needs? A popular software solution may have thousands of customers, but does it provide what you need? For this reason, do not blindly shell out for popular systems. Read at least a few Foundant reviews and consider the aspects that you want in the software such as the fees, main functionality, available integrations etc. Then, select a few solutions that fit your requirements. Check out the free trials of these platforms, read online reviews, get clarifications from the vendor, and do your research systematically. This profound homework is certain to help you select the finest software platform for your firm’s unique needs. How Much Does Foundant Cost? Foundant offers a quote based enterprise pricing. Contact The vendor for a detailed custom quote. We realize that when you make a decision to buy Grant Management Software it’s important not only to see how experts evaluate it in their reviews, but also to find out if the real people and companies that buy it are actually satisfied with the product. That’s why we’ve created our behavior-based Customer Satisfaction Algorithm™ that gathers customer reviews, comments and Foundant reviews across a wide range of social media sites. The data is then presented in an easy to digest form showing how many people had positive and negative experience with Foundant. With that information at hand you should be equipped to make an informed buying decision that you won’t regret. What are Foundant pricing details? What integrations are available for Foundant? If you need more information about Foundant or you simply have a question let us know what you need and we’ll forward your request directly to the vendor.